Hello, and welcome to JT Hughes Honda in Shrewsbury. 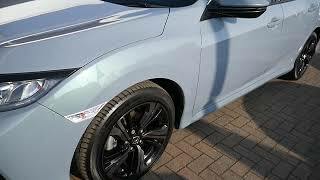 Today I'm going to show you around our used, very clean Honda Civic we currently have for sale. Now, this is the SR, finished off in the Sonic Grey Metallic paint and it's a 67-plate. Let's start from the rear. On the SR, you do get your rear parking sensors as standard. You do also get the rear parking camera. It's a great driving aid, and then ample space in the boot. Quite surprising really from a car that looks the way it does. You do get privacy glass in the rear. 17-inch alloy wheels, and cloth interior throughout. On the Civics, you do get your indicators in the wing mirrors and on the side of the wings. The SR does come with front fog lights, LED daytime running lights, halogen headlights, front parking sensors. And up in the centre of the windscreen, you've got your cameras and your sensors. Now, they're all there for all your driving aids and all your safety features. This one will still come with manufacturer's warranty and you also have the option to upgrade that at a cost of £299. On to the driver's point of view, it does come with a multi-function steering wheel with built-in Adaptive Cruise Control, and Lane-Keeping Assist. Bluetooth facilities, automatic wipers and auto headlights. Here you've got your Honda Connect 7-inch touchscreen with your built-in DAB digital radio. It does also come with Android Connect and your Apple Carplay. And this is the 1-litre turbo with the 6-speed manual gearbox, electric handbrake, storage facilities in the armrest. Mileage on this one is just under 4,300, likely it's due to test drives. Again, being a Honda Approved vehicle, flexible finance options are available, such as hire-purchase or PCP, as well as service plans with our service department. If you've got any further questions at all, or you'd like to book yourself a test drive, please give us a call here, and as always, we'll be happy to help.